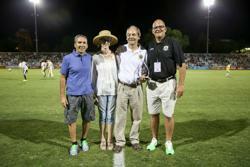 During halftime of Saturday’s Republic FC vs Newcastle United match, Republic FC recognized Gerhard Achtelik as the 2015 Sacramento Spirit Award recipient. A native of Germany, Achtelik has provided more than 30 years of service to the Sacramento soccer community. Achtelik joined the Sacramento Adult Soccer League in the 1980s, and has gone on to preside the league for over a decade. His efforts have guided the growth of the league, which features more than 38 teams with adult players of all ages that continue to play the sport they love. In addition to his role as SASL president, Achtelik also directs the Sacramento Gold Cup, the longest running adult tournament in the area. Republic FC President Warren Smith and last year’s recipients, the Sacramento Knights, presented the Sacramento Spirit Award to Achtelik. 2. Broadway District: Future R Street? Could the Broadway District, home of Republic FC’s Headquarters, be the future R Street and next big revitalization project in Sacramento? In a recent survey by the Sacramento Business Journal, all signs point to yes. Plans include a bridge connecting Sacramento to West Sacramento and more than half a dozen redevelopment projects in the Broadway district between the Sacramento River and Highway 99. Plans are also in the works to give Broadway a street makeover, designed to make the area more pedestrian and cyclist friendly. In addition the city is exploring options such as parklets and other measures to make the streetscape more inviting. However, street redevelopment plans would not be finalized until 2016. The World Rugby Pacific Nations Cup returns to Bonney Field for the second year in a row, this time bringing twice the international rugby as 2014. On Friday, July 24, Bonney Field will host a doubleheader featuring Fiji vs Samoa at 5 p.m. followed by USA vs Japan at 8 p.m. The Eagles return to Bonney Field after suffering a narrow 21-16 loss to Samoa in their first 2015 Pacific Nations Cup match on Saturday, July 18, at Avaya Stadium. Jesuit High School alumni Blaine Scully and Eric Fry both started for the USA on Saturday alongside Davis High School alumni Thretton Palamo. Meanwhile, Japan is set to enter the match vs USA after running over Canada 20-6 prior to the Eagles’ match at Avaya. Tickets to the Pacific Nations Cup doubleheader start at just $20 and include admission to both matches in addition to the California State Fair. Gates will open at 4:00 p.m., with Fiji vs Samoa kicking off at 5:00 p.m. followed by USA vs Japan at 8:00 p.m. Tickets are on sale at Ticketmaster.com. Both matches will be broadcast on ESPN 3 and the WatchESPN platform.